Constantine's origins are obscure and we know little about him as a man, though later Gallic writers described him as a glutton and as fickle. Orosius describes him as a soldier acclaimed only because of his name, Fl. Claudius Constantinus. His two sons were named Constans and Julian, though these may not have been their original names. Constantine was acclaimed in spring 407 in Britain to replace Gratian. After crossing to Gaul, his authority was swiftly accepted there and in Spain. The Rhine was rapidly secured. Nothing is known about the troops used by Constantine, or whether he permanently withdrew troops from Britain. Honorius sent a force under Sarus from Italy against Constantine, but, despite his initial successes in the Rhone valley, Sarus was soon forced to withdraw by Constantine's magister militum Gerontius. 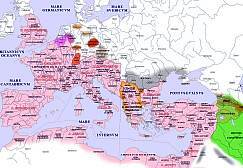 Constantine went on to occupy all of Gaul up to the Alps. By May 408, he was in control of Arles, site of the headquarters of the Gallic praetorian prefecture, which he made his base. Constantine appointed Constans as Caesar in 408 and sent him into Spain where some of Honorius' relatives had started a revolt. This revolt was suppressed, and the magister militum Gerontius was left in charge in Spain when Constans returned to Gaul. In 409, Constantine's difficulties began to increase. At about this time, Britain revolted against Constantine's rule. Constantine wrote to Honorius in late summer 409, asking forgiveness for having seized power and promising help against the Visigoth Alaric in Italy. Honorius recognized him, sending an imperial robe to Constantine and possibly granting him the consulate. In late 409, several barbarian groups, the Vandals, Alans and Suevi, crossed into Spain from Gaul. Gerontius was able to restore control over the situation, but then revolted against Constantine and acclaimed Maximus as emperor. Control of Britain and Spain was thus lost. In summer 410, Constantine crossed the Alps into Liguria, probably after negotiating with Honorius' magister equitum, Allobichus. Constantine then retreated to Gaul when he learned of the death of Allobichus whom Honorius suspected of treachery. Constantine was then faced by troops from Spain who had invaded Gaul under Gerontius, who besieged him in Arles. By now, Gerontius had promoted his son (possibly one of his staff), Maximus, to the rank of Augustus. After Alaric's death, Honorius' general Constantius entered Gaul in 411 and, after defeating Gerontius, in turn besieged Constantine in Arles. When a relieving force was ambushed by Constantius, Constantine lost hope. He relinquished the purple, took refuge in a church and was ordained before surrendering to Constantius. Constantine was then sent to Italy, but was murdered before he reached Honorius. His head was sent to Ravenna where it was exhibited from September 18, 411. Demougeot, E., 'Constantin III, empereur d'Arles', in L'Empire romain et les barbares d'Occident, ed. Christol, M. and Gayraud, M., (Paris, 1988), 171-213. Drinkwater, J.F., 'The Usurpers Constantine III (407-411) and Jovinus (411-413)', Britannia 29 (1998), 269-298. Kent, J.P.C., Roman Imperial Coinage volume 10 (London, 1994). Prosopography of the Later Roman Empire, vol. 2, ed. J.R. Martindale (Cambridge, 1980), 316-317. Salway, P., Roman Britain (Oxford, 1981), 426-445. Seeck, O. "Constantinus (5)." RE 4: 1028ff. For references to primary sources, see entries in RE or the PLRE. Translations of much of the source material can be found in C.D. Gordon ( The Age of Attila: Fifth-Century Byzantium and the Barbarians [Ann Arbor, 1960]) and R.C. Blockley (Fragmentary Classicising Historians of the Later Roman Empire [Liverpool, 1983], vol. 2). Constans was the elder of the two sons of Constantine III who had rebelled against Honorius in 407 and controlled Gaul, Spain and Britain. His father appointed him as Caesar in Gaul in 408 and sent him into Spain where some of Honorius' relatives had started a revolt. This revolt was suppressed, some of Honorius' relatives were executed, and the magister militum Gerontius was left in charge in Spain. Constans left his wife and court at Saragossa in Spain and returned to Arles in Gaul. In September 409 several barbarian groups (Suevi, Alans, Vandals) broke into Spain through the Pyrenees. Constantine III raised Constans to the rank of Augustus in late 409 or early 410 before sending him back to Spain; lead elements of Constans' army were sent into the peninsula. The threat of being replaced prompted Gerontius to revolt, acclaiming Maximus as emperor, and to join forces with the barbarians who had recently entered Spain. When the news of Gerontius' revolt and Maximus' seizure of power was received at Arles, Constans abandoned the expedition and stayed in Gaul. In 411 Gerontius invaded Gaul where he besieged and captured Constans at Vienne. After his capture, Constans was executed by Gerontius. Prosopography of the Later Roman Empire, vol. 2, ed. J.R. Martindale (Cambridge, 1980), 310. Seeck, O. "Constans (6)." RE 4: 952ff. Maximus was the son (or possibly a retainer) of Gerontius, a general of Constantine III in Spain in 409. His character was described as modest and humble. After Gerontius rebelled against Constantine III, he acclaimed Maximus as Augustus in Tarraco. Gerontius then marched into Gaul, leaving Maximus in Spain. When he learnt of the defeat of Gerontius by Constantius at Arles in 411, Maximus fled to the barbarian troops who had remained in Spain. After his flight, little is known of Maximus. He was apparently still alive in 417, and is probably the Maximus captured in Spain in 422 and executed at Ravenna. Ensslin, Wm. "Maximus (81)." RE supp. 5:673ff. Matthews, J.F., Western Aristocracies and Imperial Court, A.D. 364-425 (Oxford, 1975), 311-313. Seeck, O. "Gerontius (6)." RE 7:1270.25ff. Scharf, R., 'Der spanische Kaiser Maximus und die Ansiedlung der Westgoten in Aquitanie' Historia 41 (1992), 374-384. Priscus Attalus was Augustus twice, 409-410 and 414-415. He was a Greek from Asia whose father had moved to Italy under Valentinian I. Attalus was prominent in the Senate in the early fifth century and remained a pagan. In 409 he was appointed as Urban Prefect of Rome by Honorius. After Alaric occupied Rome in late 409, he acclaimed Attalus emperor. Attalus represented the interests of many of the senatorial aristocrats, interests which differed from those of the emperor Honorius in Ravenna. This limited the appeal of Attalus' authority to Italy and even here he was not universally accepted. Attalus was baptized during his reign by an Arian Gothic bishop. An expedition was sent against the comes Africae Heraclianus, but was unsuccessful. In the summer, Attalus marched on Ravenna in the company of Alaric. During negotiations, Honorius offered to share power with Attalus, but Attalus rejected his offer and continued to besiege Ravenna. The failure of the African expedition allowed Heraclianus to control shipments of grain to Italy, causing shortages of food there. When Attalus returned to Rome, he refused to allow a Goth to command a second expedition against Africa. This act induced Alaric to depose Attalus in summer 410 and to attempt to negotiate again with Honorius. These negotiations failed, and soon afterwards, Alaric sacked Rome. After his removal from power, Attalus remained with the Goths, even when they moved to Gaul. When Ataulf married Galla Placidia at Narbo in early 414, Attalus delivered the wedding speech. Later in 414, Honorius' general Constantius (who went on to become emperor in 421) blockaded the Goths and began more aggressive military action. In reply, Ataulf acclaimed Attalus as Augustus. Constantius' blockade was effective and forced the Goths to move into Spain in 415. Attalus attempted to escape from the Goths but was captured by Constantius' forces. When Attalus was captured, he was sent to Ravenna. From here, he was mutilated, led in triumph in Rome and then exiled to the Lipari islands in 416. Matthews, J.F., Western Aristocracies and Imperial Court, A.D. 364-425 (Oxford, 1975), 284-306. Prosopography of the Later Roman Empire, vol. 2, ed. J.R. Martindale (Cambridge, 1980), 180-181. Seeck, O. "Attalus (19)." RE 2: 2177ff. Jovinus was from a noble Gallic family, probably from the south of Gaul. After the defeat of Constantine III in 411 and the departure of Honorius' troops to Italy, Jovinus seized power at Mainz with the support of some Alans under Goar and Burgundians under Guntiarius. He was also strongly supported by the Gallic aristocracy and minted coins in Lyon, Trier and Arles. In early 412, Ataulf and his Goths entered Gaul and began to negotiate with Jovinus. Negotiations were broken off when Sarus, a blood-enemy of Ataulf, offered his services to Jovinus. Jovinus then acclaimed his brother Sebastianus as Augustus in 412. The acclamation of Sebastianus caused Ataulf to reopen negotiations with Honorius. When Honorius accepted the offer, Ataulf besieged Jovinus at Valentia in 413. After his capture, Jovinus was sent to Narbo where he was executed by Dardanus. His head arrived at Ravenna in late August. Prosopography of the Later Roman Empire, vol. 2, ed. J.R. Martindale (Cambridge, 1980), 621-622. Scharf, R., 'Jovinus - Kaiser in Gallien', Francia 20 (1993), 1-13. Seeck, O. "Iovinus (5)." RE 9: 2012ff. Sebastianus was a southern Gallic aristocrat, and a brother of Jovinus who had seized power in Gaul in 411 after the defeat of Constantine III. Very little is known of Sebastianus except that he had a weak personality. Sebastianus was acclaimed as Augustus by Jovinus in 412 after negotiations with the Gothic king Ataulf had been broken off. Coins were minted for Sebastianus at Arles and Trier. Sebastianus was captured by Ataulf and executed by Honorius' Gallic praetorian prefect Dardanus in 413. After his execution, his head arrived at Ravenna in late August. Prosopography of the Later Roman Empire, vol. 2, ed. J.R. Martindale (Cambridge, 1980), 983. Seeck, O. "Sebastianus (5)." 3.2: 954. Constantius was a soldier from Naissus in Dacia. Although he presented a fierce facade in public, he was far more relaxed in private and at banquets. Constantius was a Catholic. He had a successful career as one of the most important magistri militum of Honorius after the death of Stilicho in 408. He was able to defeat Gerontius and Constantine III in Gaul in 411 and expelled the Goths under Ataulf from Italy in 412. Constantius married Honorius' half-sister Galla Placidia in 417 at the urging of Honorius; and they produced a son, Valentinian (III) in 419. On February 8, 421 Constantius was acclaimed as Augustus in the West and Galla Placidia was raised to the dignity of Augusta. These statuses were not recognized in the East. Constantius was said at his death to have been planning a campaign against Theodosius II because of this slight. He died of illness September 2, 421. Although he was not emperor for long, he complained about the burden of office-holding, especially his loss of personal freedom. Matthews, J.F., Western Aristocracies and Imperial Court, A.D. 364-425 (Oxford, 1975), 377-378. Prosopography of the Later Roman Empire, vol. 2, ed. J.R. Martindale (Cambridge, 1980), 321-325. Seeck, O. "Constantius (9)." RE 4:1099ff. For references to primary sources, see entries in RE or the PLRE. Translations of much of the source material can be found in C.D. Gordon ( The Age of Attila: Fifth-Century Byzantium and the Barbarians [Ann Arbor, 1960]) and R.C. Blockley (Fragmentary Classicising Historians of the Later Roman Empire [Liverpool, 1983], vol. 2.). After the death of Honorius on August 15, 423, his closest male relative was Valentinian, son of Galla Placidia. Valentinian was currently at Constantinople. This power vacuum allowed Ioannes, the primicerius notariorum (chief notary) to seize power in the west. Virtually nothing is known of Ioannes himself, though he was said to have had a mild character. He was supported by the magister militum Castinus and by Aetius, son of the magister militum Gaudentius. After his acclamation at Rome, Ioannes transferred his capital to Ravenna. Ioannes' rule was accepted in Gaul, Spain and Italy, but not in Africa. Ioannes' attempts to negotiate with the eastern emperor Theodosius II were unsuccessful. He seems not to have had a firm grasp of power and this encouraged eastern intervention. In 425, Theodosius II sent an expedition under the command of Ardabur the Elder to install Valentinian as emperor in the west. Ardabur was captured, but treated well, as Ioannes still hoped to be able to negotiate with Theodosius. Ardabur, however, persuaded some of Ioannes' officials to betray him. After his capture, Ioannes was taken to Aquileia where he was mutilated, then executed. Three days after Ioannes's execution, one of his generals, Aetius, arrived in Italy with a large force of Huns. Rather than continue the war, Valentinian bought off the Huns with gold and Aetius with the office of comes. Matthews, J.F., Western Aristocracies and Imperial Court, A.D. 364-425 (Oxford, 1975), 379-381. Oost, S.I., Galla Placidia Augusta (Chicago, 1968). Prosopography of the Later Roman Empire, vol. 2, ed. J.R. Martindale (Cambridge, 1980), 594-595. Seeck, O. "Ioannes (8)." RE 9.1745ff. Copyright (C) 1999, Hugh Elton. This file may be copied on the condition that the entire contents, including the header and this copyright notice, remain intact.